For most cases, a few Amicus Curiae (“Friend of Court”) briefs with irrefutable arguments are enough. But in a case where the ACLU and National Abortion Federation have already submitted their Amicus brief to the trial court, contrary to court rules, we should expect infanticidists to throw everything they’ve got at the Supreme Court, on the theory that strength is in numbers. The unborn should be represented there too. Where irrefutable arguments undermining Roe v. Wade are nothing new, but the response of hundreds of judges has been to superglue their fingers in their ears, numbers will demonstrate to these judges not just that the arguments are legally sound, but that “everybody” knows they are. Luke 18:2-8. 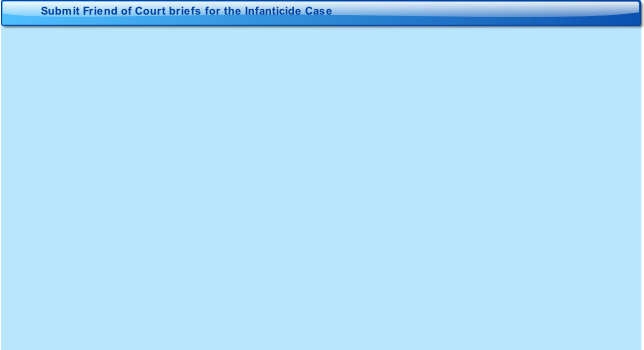 We need to ask prolife attorneys to file amicus briefs. Prolife attorneys are more likely to get permission to file their briefs if they can say they are representing a prolife organization: we need to ask prolife groups to let themselves be so represented. Individuals who are not attorneys can also ask the court for permission to file an amicus. If permission is denied, they can then put just about the same information in a simple letter to each of the justices. Anyone can write to the justices. Sufficient pressure on the justices to finally address these issues squarely holds the potential for Stopping Legal Infanticide by Christmas. 1. Ask prolife organizations to authorize their attorneys to represent them in an amicus. If they have no attorney to do that, ask if they will let another attorney represent them. 2. Ask attorneys to represent the unborn in the Roeder appeal. Either mail them the SLIC general letter with your personal note added, or draft your own letter, borrowing whatever seems useful. After a week or two, contact them again, asking what they have decided. Email your progress reports to SLIC@Saltshaker.US. 3. Ask the Kansas Supreme Court for permission to file an amicus yourself, using our suggested guidelines. If they don’t give it, write letters to the justices.